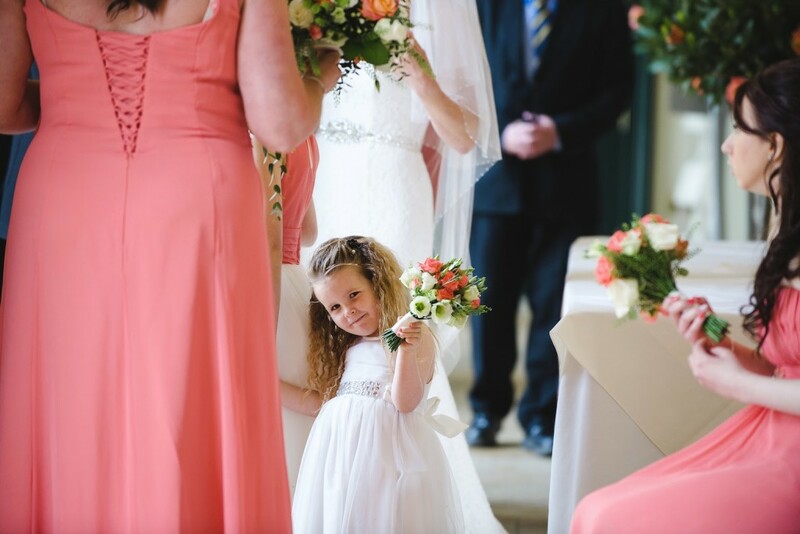 Vanessa and Stephen's beautiful coral and cream wedding in the Great Hall at Blenheim Palace, Oxfordshire - Joanna Carter Wedding Flowers | Oxford, Oxfordshire, Berkshire, Buckinghamshire and London. 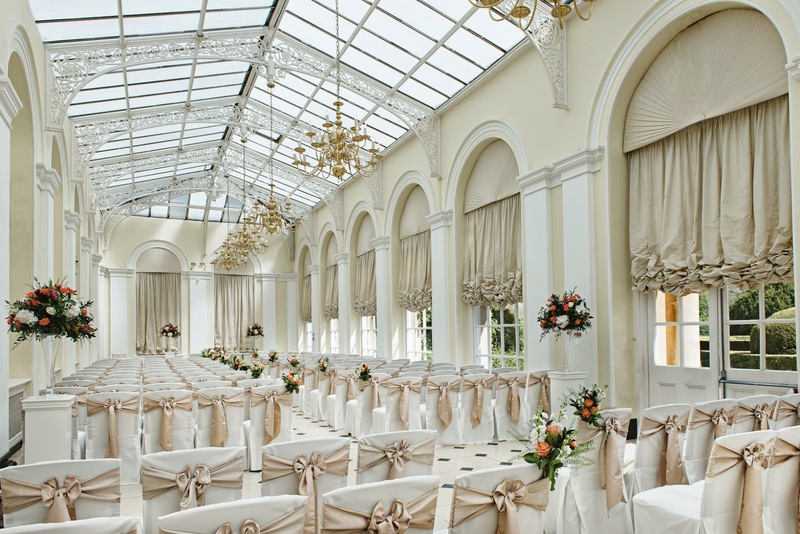 The ceremony took place in the Orangery, with tall flute vases and a large registrar’s table piece at the top of the aisle. 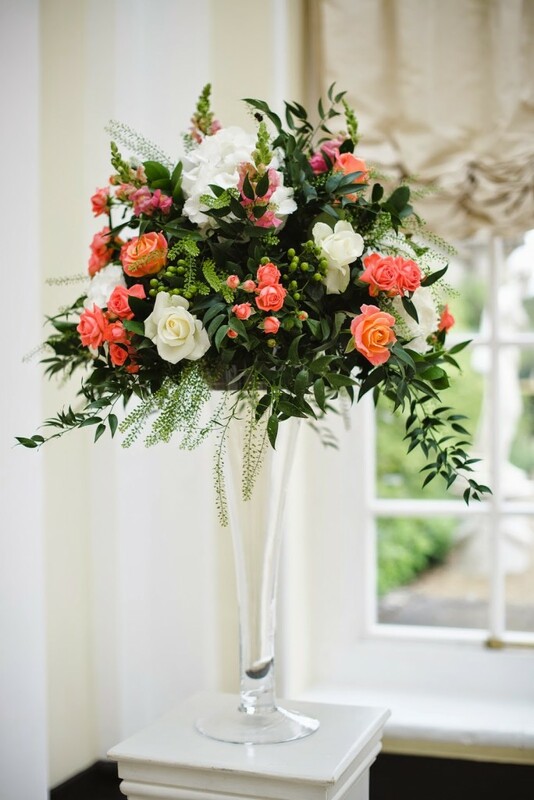 At intervals up the aisle we tucked bunches of coral roses and stocks into the chair sashes for a burst of colour. 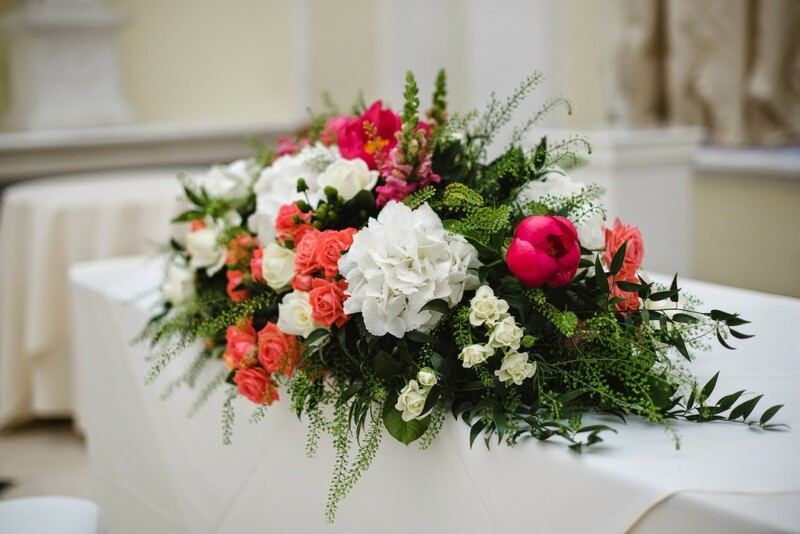 The richly coloured Registrar’s table piece which was later moved to the top table in the Great Hall. 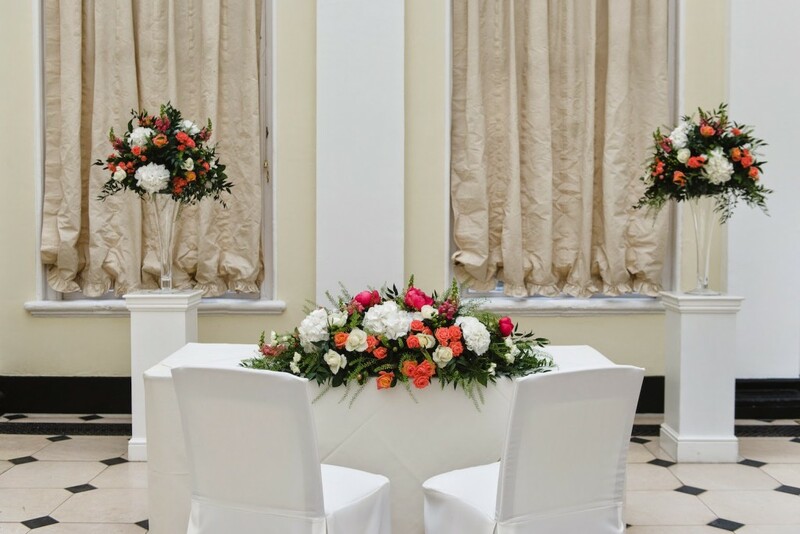 The tall flute vases placed on either side of the Registrar’s table. 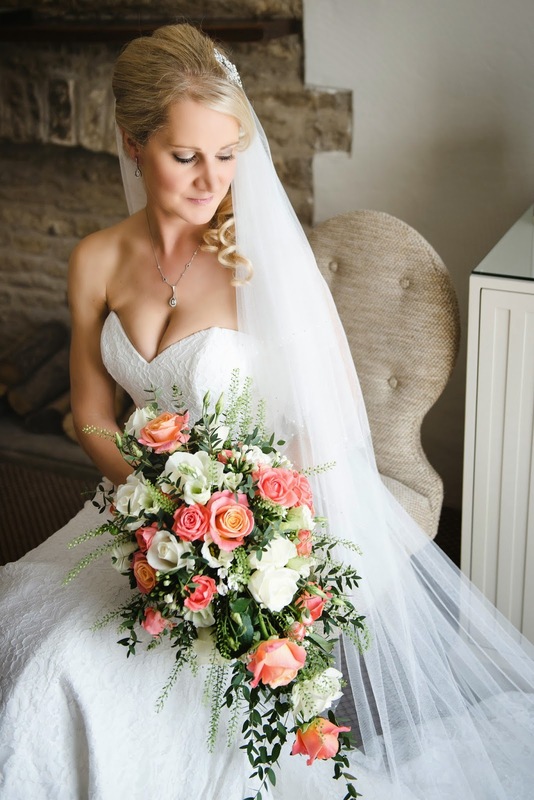 Vanessa chose a trailing shower bouquet with ivory and coral roses, lisianthus, bouvardia and lily of the valley with ruscus and parvifolia foliage. 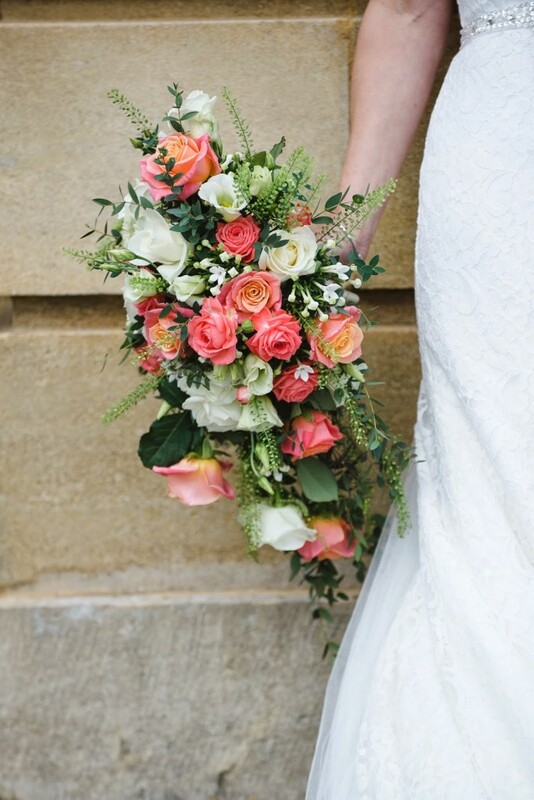 Vanessa with her flowing shower bouquet of miss piggy coral roses, cream avalanche roses, lisianthus, bouvardia and lily of the valley. 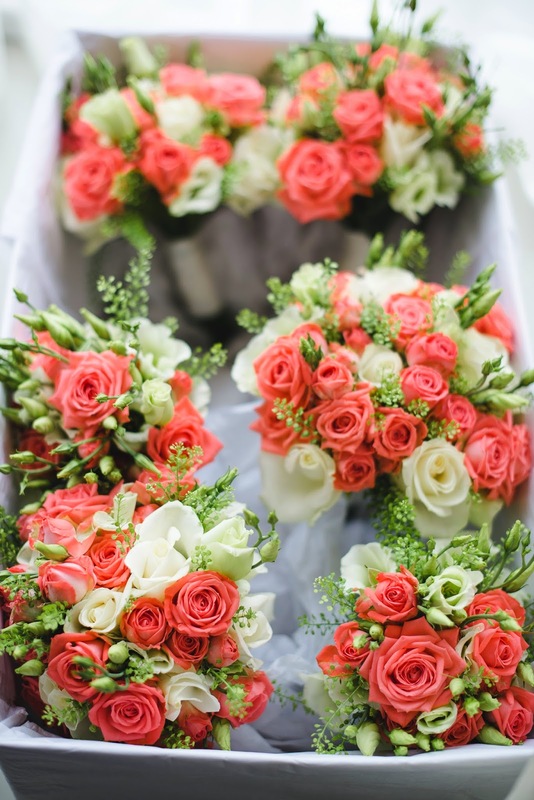 A stunning box full of bouquets for bridesmaids and flower girls waiting to be handed out. 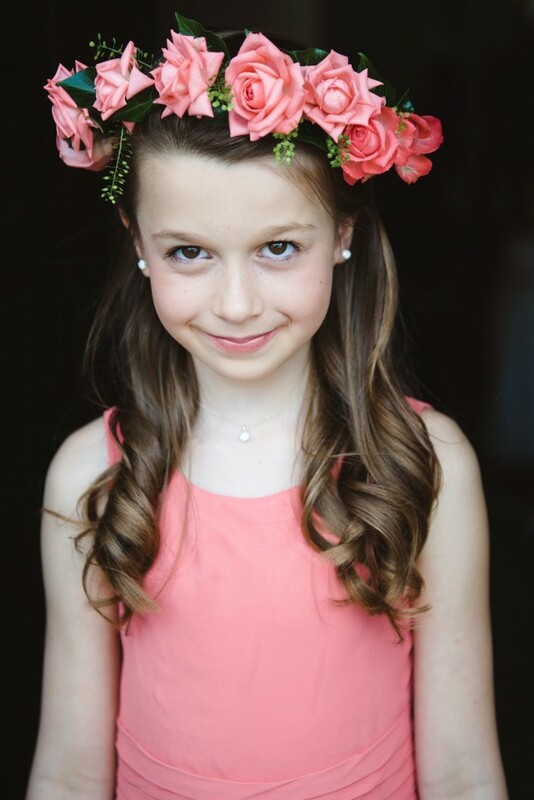 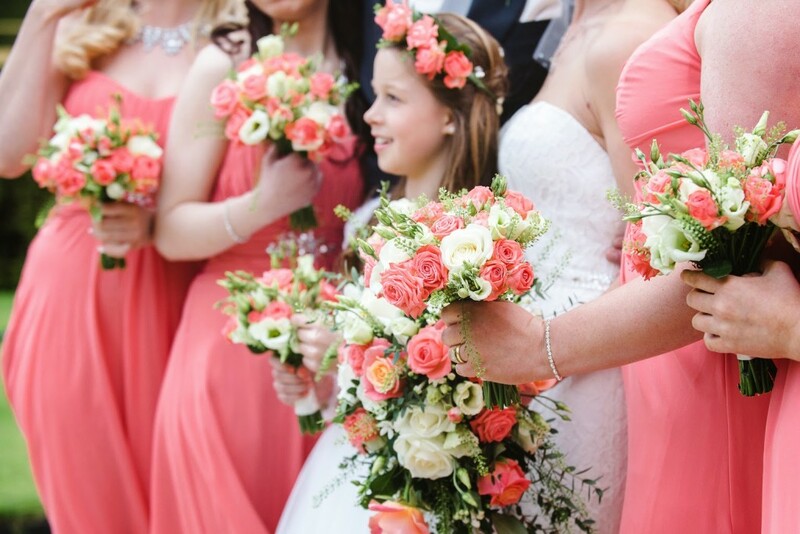 For the younger flower girls we made spray rose circlets in rich coral . 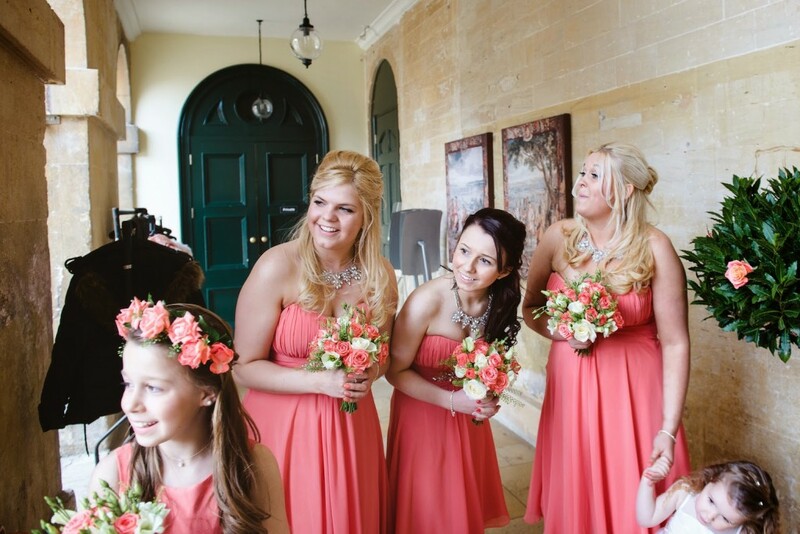 The bridesmaids in the Colonnades awaiting Vanessa’s arrival. 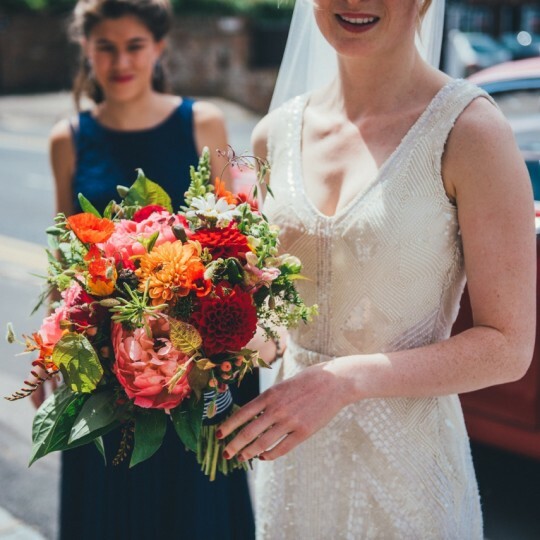 The flowers were a perfect match for the dresses and were a really vibrant mix. 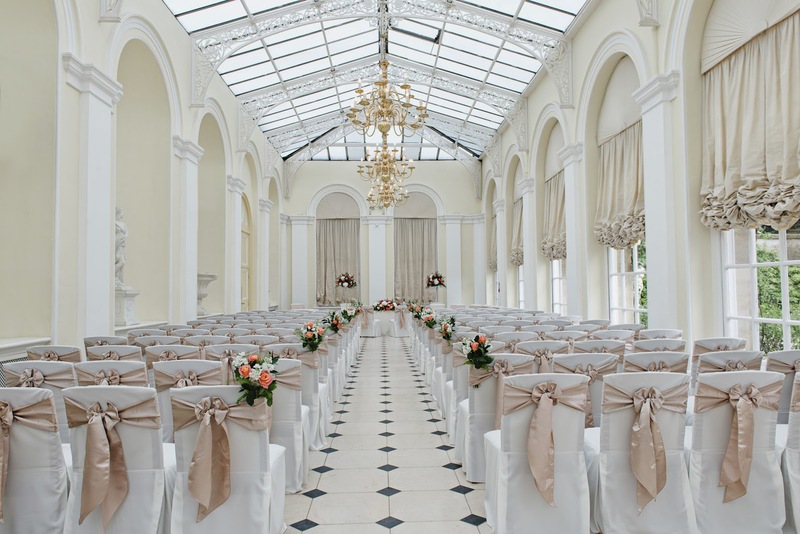 Following the ceremony in the Orangery, guests walked over to the Palace. 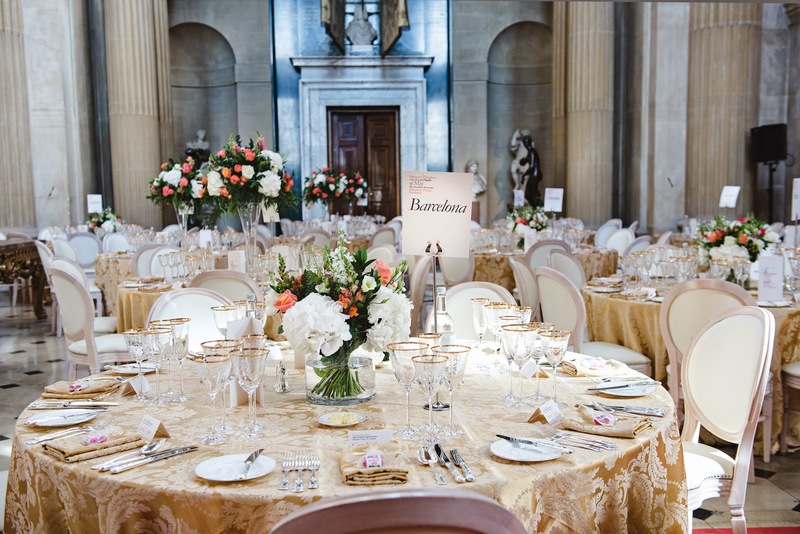 The wedding breakfast was held in the amazing setting of the Great Hall. 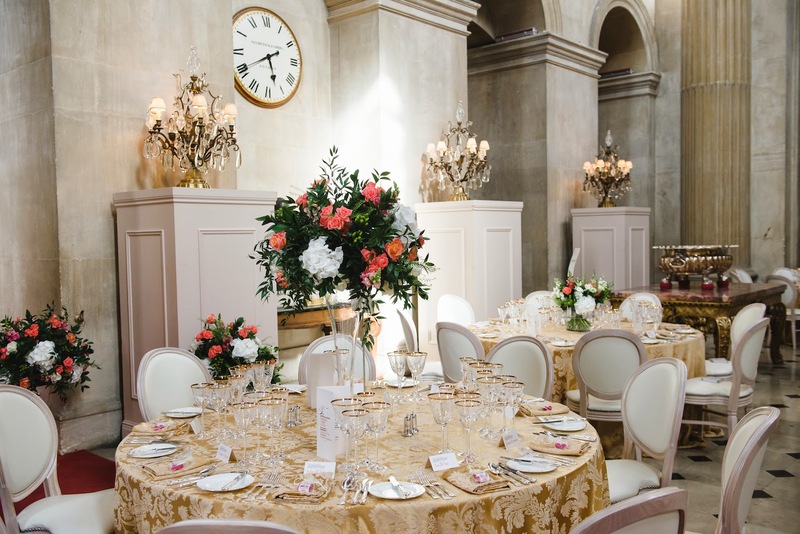 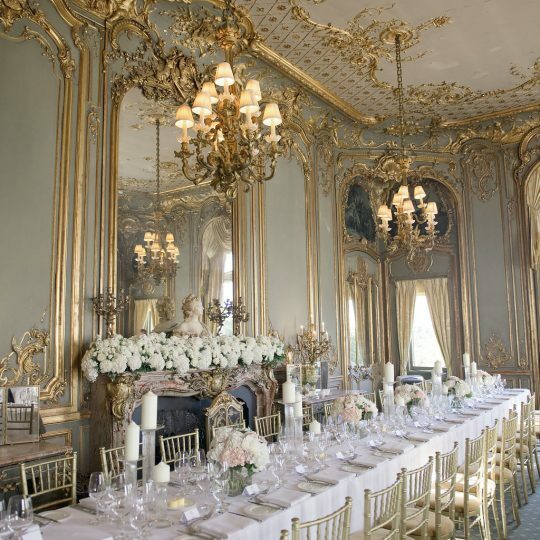 Alternate tables had either tall flute vases or low round cylinder vases, both of which were filled with a mix of coral coloured roses, ivory hydrangeas, soft green lisianthus, ivory avalanche roses, bouvardia, thlaspi and ruscus foliage. 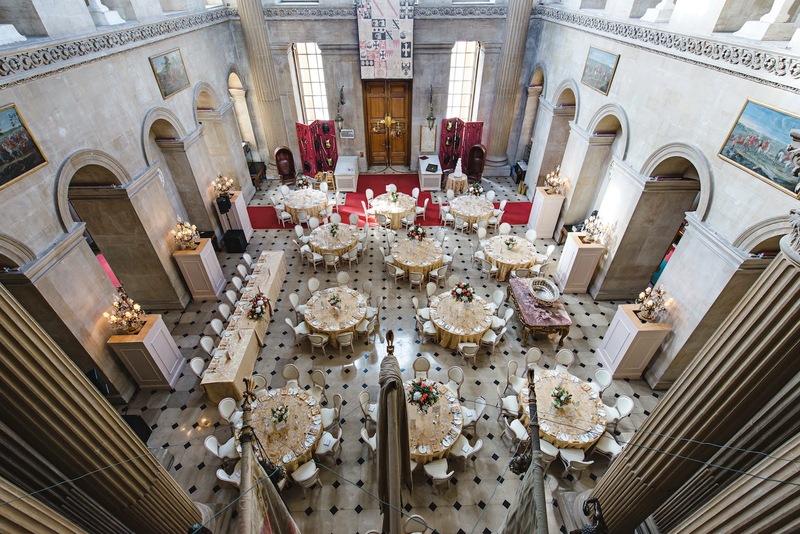 The view of the Great Hall from the galleried landing upstairs was wonderful. 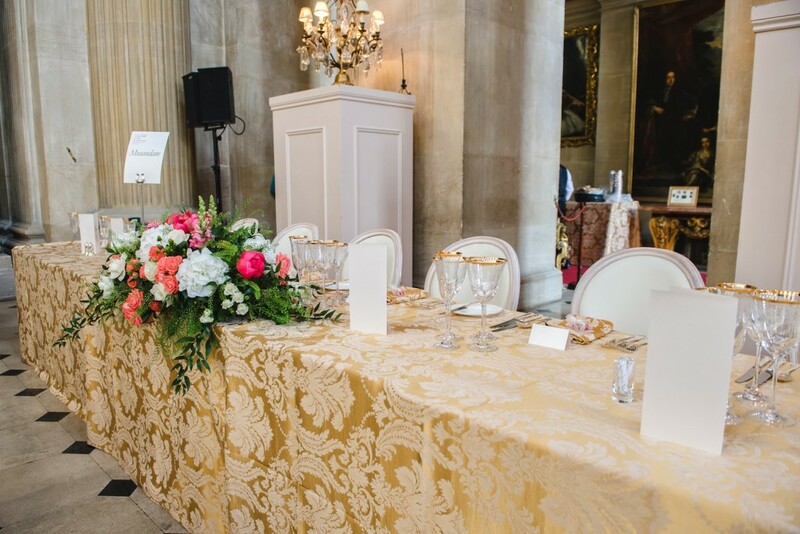 We moved the Registrars table piece to sit on the top table during the wedding breakfast. 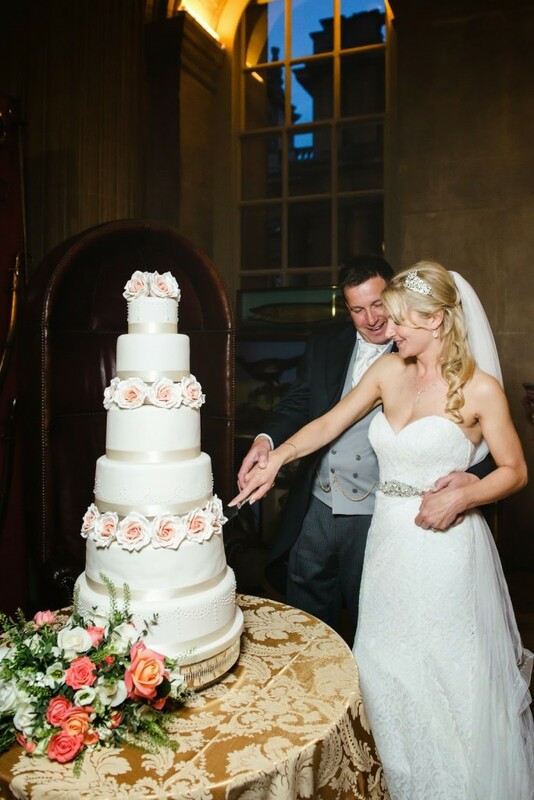 Vanessa and Stephen with their stunning six tier cake complete with peach roses.